Students in TRIN371 (Advanced Web Page Building), a course in the Department of Translation and Interpretation, have been building websites for Bilkent entities for 13 years. “They saved the best for last,” she added with a smile. Each year, Ms. Maloney contacts various departments and organizations to see if they would like a website to be rebuilt, or built for the first time. During the second half of the course, students build websites. This year, 16 students built websites for five Bilkent entities. To celebrate the completion of the five projects, on Friday, February 2, Ms. Maloney and Dr. Jacques Morin (Department of Archaeology) hosted the students in their home for the seventh annual Web Page Wassail Party. Two coordinators – Dr. Downey and Dr. Yılmazer – also came to the party. 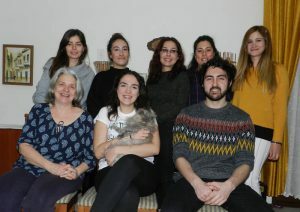 Students in the project not shown in the photo above were Sevim Coşkun and Bartuğ Çelik – both from the Department of Philosophy – and Caner Ercan, Ozan Güner, Mert İlyas, İlayda Özveren, Günce Ünal, Eren Yangın and Umut Can Yüce. To view the students’ work on the website building projects from this and previous years, see http://maloney.bilkent.edu.tr/rWebPages.htm.